Ever wanted to know how co, koa, and regenerator work? The notion of generators is a groundbreaking new feature in ES2015, one of the few that isn't trivial to implement using the old ES5 spec. Generators help you write asynchronous code without callbacks, calculate the billionth Fibonacci number without blocking the event loop, and write web servers that actually know when they're done writing the HTTP response. 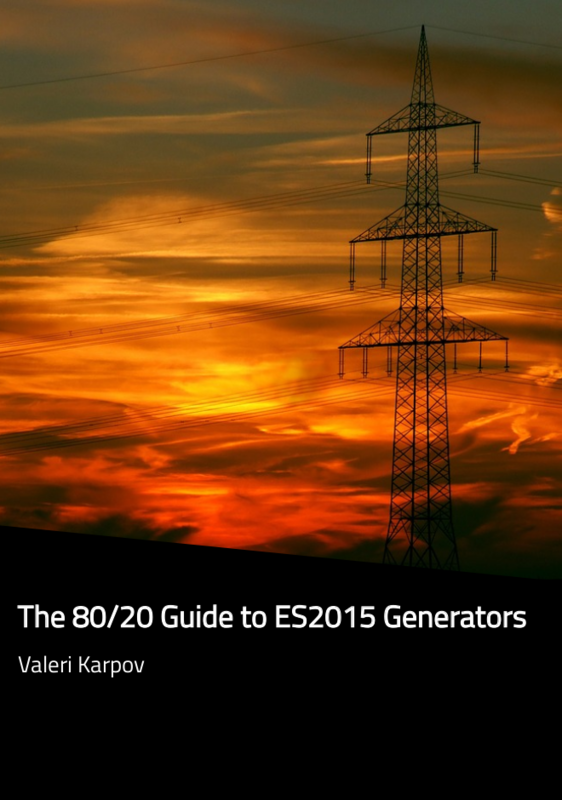 The 80/20 Guide to ES2015 Generators provides a comprehensive introduction to generators by showing you how to implement minimal versions of 3 influential generator-based npm modules: co, koa, and regenerator. Don't worry about slogging through another drawn-out tech book: in keeping with the Pareto distribution, this book focuses on the essentials and is designed to be read in under 2 hours.